It’s Groundhog Day in Punxsutawney, Pennsylvania, the day when Punxsutawney Phil is awoken on Gobbler’s Knob and tells the future. This year at the Super Bowl TruTV switched Phil for Pittsburgh Steelers player Troy Polamalu, leading to an unusual prediction, six more weeks of football. This is the company that provides not reality, but actuality. The Punxsutawney Polamalu spot was developed at Grey, New York, by chief creatve officer Tor Myhren, creative director Noel Cottrell, art director Allbriton Robbins, copywriter Beau Unruh, agency director of broadcast production Bennett McCarroll and agency producer Todd Scheifele. Filming was shot by director Mike Maguire via The Directors Bureau, Los Angeles, with director of photography Kasper Tuxon. Editor was Ian Mackenzie at Mackenzie Cutler. Music was produced at Pulse Music. Sound was designed by Peter Holcomb at Sound Lounge with assistant engineer Justin Kooy. 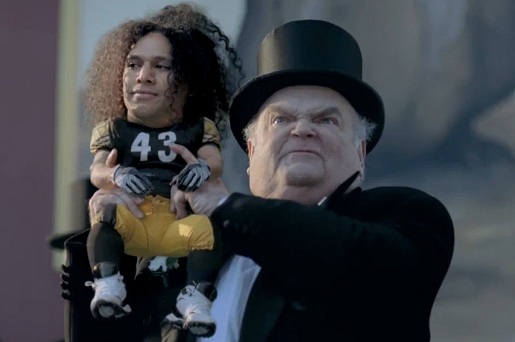 Polamalu’s double is Puppet the Psycho Dwarf Steve Richardson.